Recently we stay at Jill’s cabin #2 January 2017 for eight nights. When we decided to head to the mountains, I researched everywhere to find one on the Blue Ridge Parkway because of the wild life and scenery . We got that from the cabin it was exactly what we wanted . The view was awesome of the mountains while sitting in the hot tub , the fire pit was by the creek and we spent every night down there making smores And just relaxing . 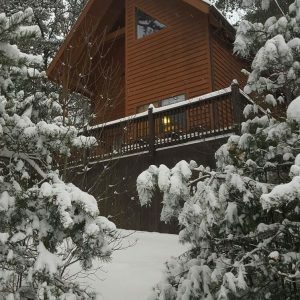 The cabin was perfectly located to food shopping ,tubing ,skiing , or just scenic driving thru the tunnels on parkway and Grandfather Mt . We enjoyed staying up trying to watch for wildlife walking thru the property . We saw plenty of turkey . The Cabin had everything we needed for our stay and we will definitely be returning next winter . I would absolutely recommend her cabins . Thank you Jill for being a great host and making sure everything was perfect upon arriving you’re a pleasure to work with !